Ammi Ribar was born in Hudson, NY in 1981 and did his first Antique Show at 11 days old. He never looked back. 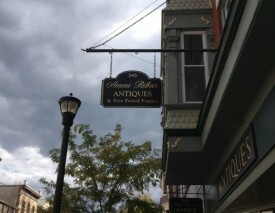 Now, with over a decade of experience, Ammi Ribar Antiques & Fine Period Frames, located in the heart of Historic Hudson, strives to provide a comprehensive selection of antique mirrors and frames of all periods to dealers, decorators, and collectors alike. Additionally, a carefully selected inventory of antique furnishings, lamps, and accessories are always available.